As part of Twist Bioscience’s fourth birthday celebration, we made our way to King’s College London for SynBioBeta 2017 – a fitting place for a party considering it was at this conference in 2015 where we first announced the opening of our Alpha Access program. This year’s big announcement from Twist was the preview of our ecommerce platform, making ordering and buying DNA faster and simpler than ever. SynBioBeta is a unique conference, uniting representatives from across the synthetic biology community in the center of London. While there attendees are treated to diverse talks from industry leaders, startups, academics, non-profit organizations, investors and government representatives, all invited to weigh in on the future of the field. Drew Endy, Professor of Bioengineering at Stanford and co-founder of iGEM, spoke about the birth of the synthetic biology field in 2003 and his team’s groundbreaking collaboration with DARPA. Since that first paper, our ability to use the very fabric of life as an engineering platform has undergone considerable development. Increased availability of a broader tool set has accelerated synthetic biology while the cost of materials has dropped. For example, in 2003 DNA cost $4 per base pair, 15 years later Twist Bioscience can sell the same base pair almost 60x cheaper, for 7¢. Twist CEO Emily Leproust spoke at the event, highlighting this velocity by sharing that Twist has already shipped over 31,000 genes in the first quarter of 2017 compared to 35,000 genes shipped in all of 2016. SynBioBeta 2017 showcased that with ever-advancing tools and ambitious ideas, synthetic biology is already becoming a part of our everyday life. Most of the research presented has real-world applications and offers just a glimpse of how important synthetic biology will be in the near future. Parisian startup Glowee is tackling light pollution. Nineteen percent of global energy consumption goes towards lighting. Our cities are often over-illuminated and wasting energy. For humans, harsh environmental lighting causes circadian disruption and is linked to sleep disorders. Wildlife are also adversely affected, especially nocturnal animals. 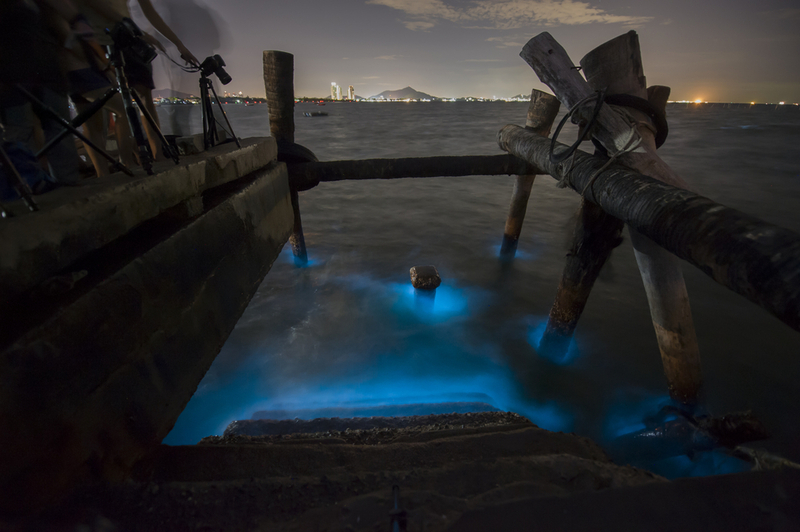 Glowee borrows from bioluminescent marine organisms. The organisms create their own light from a genetically controlled chemical reaction that occurs within their cells. Transferring the light-creating genetic machinery from nature into a safe, non-pathogenic bacterium causes the bacterium to light up! Glowee hopes that these luminescent bacteria can be integrated into local infrastructures to emit a soft glow, replacing harsh orange lighting. Sandra Rey, Glowee’s founder and CEO, indicated that the company has already showcased their glowing bacteria in art installations. Glowee is working with energy companies to strategize how the luminescent cultures could one day be distributed. CustoMem is a company led by innovators who came through the Imperial College London iGEM team in 2014. They offer a biological solution to the safe filtering of micropollutants from our water systems. Micropollutants are water contaminants that are by-products of chemical processes, consumer waste or industrial runoff. They can be as small as 0.01 microns, too tiny for a Brita. CustoMem claims to provide an ultrafiltration device that is plug-and-play, able to capture micropollutants from industrial wastewater. Their technology uses bacterial cellulose as the filter because it offers high purity, strength and moldability. The membranes can be engineered to be highly selective for specific pollutants. By developing tools to engineer the genomic cellulose making tools of Komagataeibacter rhaeticus for highly controlled cellulose production, CustoMem can produce low cost, highly-accessible filtration devices. We are biologically hardwired to seek out sweet stuff. But today, with access to regular meals, sugar is no longer a matter of life or death. This makes sugar easy to overeat if we’re not careful and too much is linked to diseases like diabetes, obesity, and heart disease. Sweeteners like Stevia have gained popularity recently in light of this problem. Part of IndieBio, Europe’s largest biotech incubator, Milis Bio says that they are developing an artificial sweetener with a twist – it’s not artificial! By engineering easy-to-cultivate organisms to make natural sweet proteins, Milis has produced a new sweetener that is 2,000 times sweeter than what is currently available on the market. What sets Milis’ protein apart is its ability to be engineered. Chemical sweeteners are relatively structure-bound. Changes to their chemical structure can completely change the properties of the compound, often for the worse. Proteins are different because they have plasticity to their structure, and are easily engineered through screening gene libraries. Taste perception is an interaction between receptors on the tongue and a flavor agent, and sweet proteins bind to sweet receptors. Milis is exploring whether a sweet protein can be engineered to bind to other receptors too. The company hopes to start working on an umami protein, as a replacement for monosodium glutamate, and a bitterness protein that blocks unpleasant bitter flavors to help with medicine taking. SynBioBeta is a conference that is not just about the tech, but also the community and the public. This year’s message was clear – public understanding and acceptance of synthetic biology needs to be nurtured if humanity is to fully see the benefits of synthetic biology.